Is it better to have a family member or an outside professional run a family business? Recent events demonstrate that there is no consensus. Last week family-controlled drinks company Pernod-Ricard appointed Alexandre Ricard, a family member, as CEO, to take over from non-family Pierre Pringuet who had held the post since 2004. Almost the same day at Canadian plane-and-train-maker Bombardier the founder’s grandson Pierre Beaudoin passed the chief executive position to a non-family member, and his father stepped down as chairman after 50 years. In recent months Luxottica’s 79 year-old founder Leonardo del Vecchio re-took control of the business, while in early 2014 Axel Dumas became CEO of Hermes after several years of non-family leadership. So which is best? It depends. Some studies have shown that non-family CEOs tend to be better educated and more experienced than family ones, and of course it stands to reason that the bigger your pool of potential CEOs, the more likely it is you will find a good one. But other studies have found that family CEOs are best, and theorised that their deeper knowledge of the business helps them outperform. However, this is all predicated on the family valuing financial performance. Some families want other things such as keeping the business in the family, stability and risk-avoidance, or finding jobs for family members. Others might value raising wages over maximising profit. These sorts of aims are known as “socio-emotional wealth”. Family members are unsurprisingly best at promoting this. Most of the research in this area centres around principal-agent problems. These arise when one person (the agent, i.e. the non-family CEO) makes decisions for another person (the principal, i.e. the family), but their interests don’t align, in this case largely because financial and socioemotional aims clash. A recent paper called When do Non-Family CEOs Outperform in Family Firms? has deepened understanding of the issue by suggesting that the context in which CEOs work makes a huge difference. The paper studied 893 medium and large entirely private family firms in Italy with a turnover of €50m plus. It looked at various leadership models and found that the best is a non-family CEO, who is closely monitored in order “to reduce opportunism” and ensure some socioemotional aims are pursued. They found that this monitoring was best carried out by “multiple major family owners who understand the business and have its best interests at heart” rather than “a single dominant owner”. You might call it the “multiple watchman model”. The study added: “Companies with concentrated ownership [ie, there is one dominant owner] and non-family CEOs… have the lowest levels of performance.” They also looked at co-CEO partnerships, where one is a family member and one an outsider – a popular model in Germany – and found that at least in Italy this does not work well. If family members are CEO, then it makes little difference whether there is one, or co-CEOs. So, according to this research the best model is a single family CEO overseen by two to four family owners. 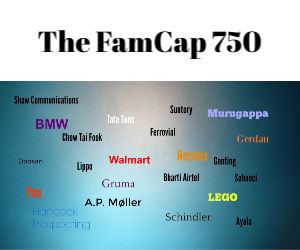 The Roman poet Juvenal asked, “quis custodiet ipsos custodes?” or, “who will watch the watchmen?” For family businesses the answer is: family members. The article referenced a study of family firms in the S&P 500 which showed that on average, 39% of the board members of family businesses are inside directors, compared with 23% in non-family companies. Of that 39%, 20% were family members. Are families who do things differently doing it wrong? Have Luxottica, Hermes and Pernod made mistakes? You could argue that their industries are special cases. You could argue that they have exceptional family CEOs. Or that what works in Italy or the S&P 500 doesn’t work for everyone. Or perhaps you could argue that the most important thing for a family business is not whether the CEO shares DNA with the founder or not, but that a family has the power to choose whether he or she does.